Foi divulgado o último estudo, realizado pela firma de design inglesa Hopkins Architects, para o velódromo que fará parte Jogos Olímpicos de Londres 2012. Este velopark, como é chamado, ficará ao norte da vila Olímpica e terá 6000 assentos na pista coberta. A pista de mountain bike, bmx e o circuito para speed serão incluídos ao velódromo. O mais interessante é que o velopark se integrará às ciclovias londrinas permitindo aos ciclistas londrinos mais uma bela opção de laser e esporte. 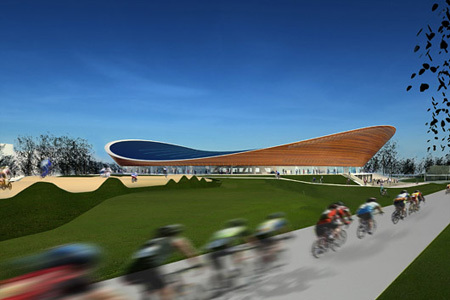 The VeloPark project team are delighted to unveil the design for the VeloPark at this very exciting time for British cycling following our team’s outstanding success in Beijing. We hope the venue and facilities we are creating will generate even more excitement in 2012 and then continue to be an inspiration for future generations of cyclists. The vision for the VeloPark has always been to create a place where both beginners and elite athletes will be equally at home. Over the last year our work has involved reviewing the design with Chris Hoy and Team GB experts as well as regularly meeting with the local cycling groups who will be using the facilities after the Games. The form of the Velodrome has been designed to express the drama and elegance of the track geometry and the project team hopes it will become one of the defining images of the Olympic Park not to mention a place where World Records will be broken. 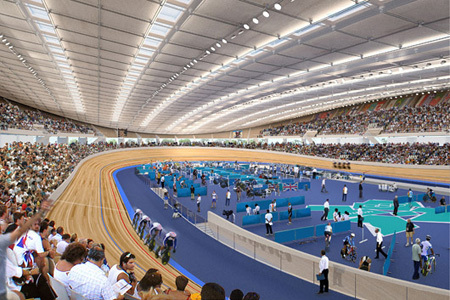 After 2012 it will continue to attract international competition and when all the outdoor circuits are complete the VeloPark will become an exciting hub for all forms of cycling in London. Isto me lembra o velódromo do Rio, por ocasião dos jogos Panamericanos. Quanta semelhança!